Are you in search of stress relief? Wholesome Energizers CD is your solution. Written and narrated by Julie Lusk. Original instrumental music by Tom Laskey. 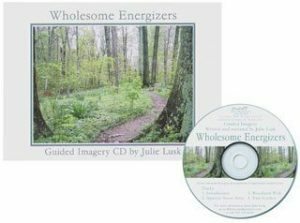 Wholesome Energizers combines relaxation, guided imagery, breathing exercises and affirmations by Julie Lusk M.Ed. with the soothing and relaxing instrumental music of Tom Laskey for stress relief. The recording on this CD take you through a comforting relaxation process to leave you feeling rested, rejuvenated, and ready for the rest of the day. Listen to this recording often for stress relief, to refresh your outlook, and feel calm and balanced. Tips from Julie about how to get the most out of listening to Wholesome Energizers. May skip after first play. Squeeze Stress Away ( 13:20 min) Guided relaxation exercise to stimulate your energy. Guided imagery and affirmations are used in a garden scene for cultivating qualities to reclaim health and inner strength.